This cultural tour takes us by our own coach to the highlights of Western and Central Turkey. We begin in Istanbul, the capital city of two of history’s greatest civilizations - the Byzantine and Ottoman empires - for over 1,500 years. In Europe we visit Gallipoli, site of a key campaign in WWI, before we cross to Asia to visit Troy. We visit many fascinating sites from Greek and Roman times such as Pergamon and Ephesus. We travel down the Aegean coast to visit the Crusader castle at Bodrum before turning inland to the ‘petrified’ waterfalls of Pamukkale. From the Turkish Riviera around Antalya we head into the heartland to visit Konya - home of the ‘Whirling Dervishes’ - and the painted underground churches in Cappadocia. In Ankara we visit one of the finest museums in the world before crossing back from Asia to Istanbul in Europe. Begins May 16 and finishes May 30 in Istanbul. AIRFARE: Our flights specialist estimates the cost of the airfare to be approximately $1,600 Canadian departing Vancouver to Istanbul & returning from Istanbul. This evening we arrive in Istanbul and transfer to our hotel. First of 2 nights in Istanbul. 4-Star Best Western Eresin Taxim Hotel or similar. No meals. Today we enjoy a guided tour of some of the main highlights of Istanbul. We start at the Hippodrome, the centre of the city in Byzantine times. We see the Egyptian obelisk presented to Emperor Theodosius in 390 AD and the area where chariot races were held. Nearby we visit the Blue Mosque. Across Sultanahmet Square, we take a guided tour of the huge Aya Sophia. Completed in 537 AD for Byzantine Emperor Justinian, this was the largest church in the world for over 900 years. 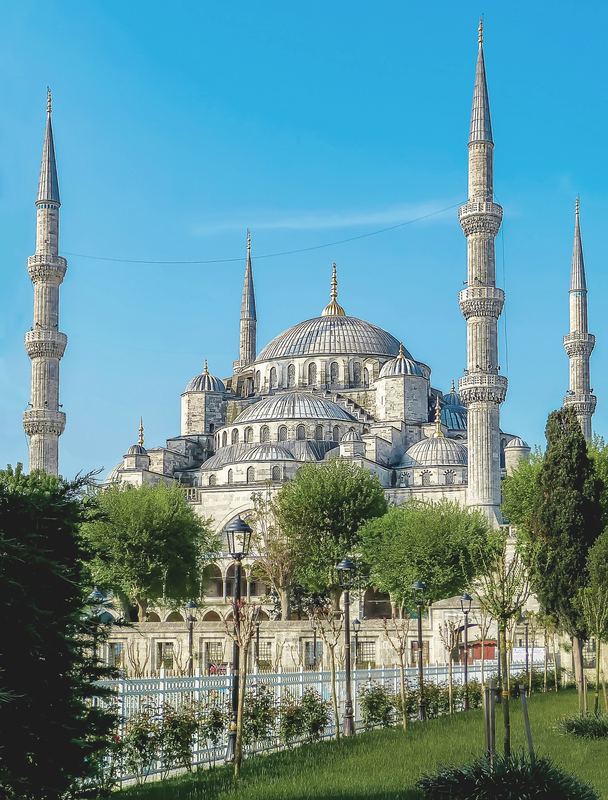 When the Turks conquered the city in the 15th Century one of the first things they did was cover up the mosaics in the cathedral and convert it to a mosque so that Sultan Mehmet, the Conqueror, could celebrate Friday prayers in his prize possession. However, the Muslims did not damage the mosaics so that today a few of the finest examples can still be seen. Outside Aya Sophia, we descend under the streets of old Istanbul to the Yerebatan Cistern, which allowed enough water to be stored for Istanbul to resist many sieges over the centuries. Today we also take a guided tour of the enormous Topkapi Palace, the centre of the Ottoman Empire for over 400 years. The palace contains dozens of rooms filled with treasures including the Spoon Diamond, one of the largest jewels in the world, and religious artifacts as well as items illustrating the lives of the Ottoman sultans and their lavish courts. A special part of our tour is the Harem, where the sultan's many wives lived in splendid isolation. Second of 2 nights in Istanbul. 4-Star Best Western Eresin Taxim Hotel or similar. Breakfast & Dinner. From Istanbul we travel west around the north (European) shore of the Sea of Marmara to Gallipoli. This was the site of one of the most important campaigns of the First World War. At dawn on April 25th, 1915, an Anglo-French army landed at Cape Helles at the entrance to the Dardanelles Strait. Simultaneously, a force of the Australian and New Zealand Army Corps (ANZACs) landed 8 miles further north. During the landings, these armies fought bravely, but after 8 months of terrible losses to them and to the Turkish defenders of the peninsula, they were evacuated. This was not only a turning point in the First World War but ruined the career of Winston Churchill, First Lord of the British Admiralty, while forging the reputation of Mustafa Kemal, the Ottoman general who went on to found the Turkish Republic under the name ‘Ataturk’. From Eceabat in Europe, we cross the Dardanelles strait to Canakkale in Asia. Our last stop today is at one of the most famous sites in the world. Troy was the focus of Homer's Iliad, which tells of the war between the Greeks and Trojans over the beautiful Helen. In the 1870's businessman and amateur archaeologist, Heinrich Schliemann excavated what he labelled as the nine cities of Troy, built one over the other. Here our guide will show us where various events in the Trojan War as described by Homer are thought to have occurred. Overnight in Canakkale. 4-Star Akol Hotel or similar. Breakfast & Dinner. Our first stop today is at Bergama. Above the quaint town on top of a hill stands the Acropolis of ancient Pergamon. The Temple of Trajan provides wonderful views over the surrounding countryside. We will see the cisterns that supplied water to the city, and the sites of the Zeus Altar and the library. This was the second most important library in the ancient world, surpassed only by that in Alexandria, Egypt. The theatre is carved directly into the hillside and was the steepest in the ancient world. In the lower area of the town, we explore the Asklepion which was one of the most important 'hospitals' in the Greek world. This healing centre used many treatments which we think of as very 'modern', such as diet, baths, music, exercise and dream interpretation. On our way south to Kusadasi we pass through Turkey's largest port, Izmir. This was once Smyrna, the birthplace of Homer. Kusadasi in Turkish means 'Island of Birds'.First of 3 nights in Kusadasi. 4-Star Tatlises Hotel or similar. Breakfast & Dinner. 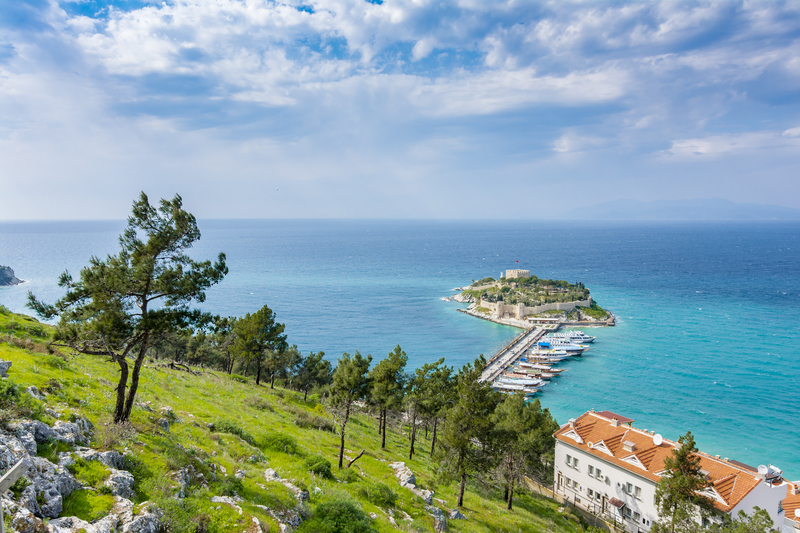 Today you have a full day free to relax and explore the delightful seaside town of Kusadasi. Second of 3 nights in Kusadasi. 4-Star Tatlises Hotel or similar. Breakfast & Dinner. Today we enjoy a guided tour of the many parts of Ephesus. The main goddess of the city was Artemis and her gigantic temple, the Artemesion, was one of the Seven Wonders of the World. Today we will see that all that remains of this once-great structure is a single column. The main site of Ephesus is very extensive. Excavation has been going on since 1895 and yet 80% of the site remains buried. The theatre is massive, seating 25,000 people. The Marble Road leads down to the Library of Celsus. Built-in 110 AD, this three-story white marble building became the third most important collection of texts in the ancient world. Above the main site is the House of the Virgin Mary where Mary, who accompanied St John to Ephesus, is said to have lived the last years of her life. We also visit the excellent museum. Third of 3 nights in Kusadasi. 4- Star Tatlises Hotel or similar. Breakfast & Lunch. From Kusadasi we head south to the Altinkum beach area we visit the massive marble Temple of Apollo at Didyma. This was the site of one of the most famous oracles in the ancient world – a place where people would come to have their fortunes told and the future predicted. Bodrum still has a strong Greek feel to it. The town is the site of one of the Seven Wonders of the World - the Mausoleum of Halicarnassus. Built in the 4th Century BC, the tomb was the largest and most elaborate ever built and has served as a model for hundreds of thousands of tombs ever since. The most prominent feature of Bodrum's yacht-lined harbour is the 15th Century Castle of St Peter built by the Knights of St John using some of the pieces of the Mausoleum. The castle is a museum today housing collections from many periods but it is particularly famous for its underwater archaeology section where artifacts salvaged from nearby ancient shipwrecks are displayed. Overnight in Bodrum. 4- Star Hotel Karia Princess or similar. Breakfast & Dinner. We head inland from Bodrum to Pamukkale. In the afternoon we enjoy a lecture and demonstration of the techniques involved in the making of one of Turkey’s most important folk arts – handmade carpets. In Turkish Pamukkale means the 'Cotton Castles'. Here mineral-rich water warmed underground breaks through the surface and cascades down the hillsides. As the hot water cools it deposits calcium-rich substances which, over centuries, have formed white terraces over a very large area. We will also see the extensive necropolis of the Roman site of Hierapolis with its huge, carved sarcophagi scattered all around. Overnight near Pamukkale. 4-Star Tripolis Hotel or similar. Breakfast & Dinner. From Pamukkale we drive across the high plains of western Turkey to an area is known as the Turkish Riviera. This afternoon, you’re free to explore the old Ottoman town of Antalya with its narrow streets, landmark Fluted Minaret, and delightful harbour. The entrance to the Old town is through a Roman gate dedicated to Emperor Hadrian when he visited the city in 130 AD. You might prefer to join our optional tour to one of the best museums in Turkey. This museum is particularly famous for its excellent collection of Greek & Roman sculptures as well as exhibits from the Karian Cave, a Palaeolithic cave dwelling 9,000 years old.First of 2 nights in Antalya. 4-Star Best Western Khan Hotel or similar. Breakfast & Dinner. The site of Perge was originally settled by the Hittites around 1500 BC but the majority of the ruins in this extensive site date from Roman times. The symbol of Perge is the two huge gate towers which lead into the well-marked ancient shopping streets of the agora. Our guided tour of the site also includes the stadium and Roman baths. Nearby the largely-unexcavated ruins of Aspendos reveal little of the once-great city except for the aqueduct and the superb theatre. This afternoon is free for you to explore Antalya. Second of 2 nights in Antalya. 4-Star Best Western Khan Hotel or similar. Breakfast & Lunch. Travelling inland again we are treated to stunning panoramas of mountains sweeping down to the azure-blue Mediterranean. Climbing up onto the Anatolian Plateau we reach the holy city of Konya. In the 12th and 13th Centuries, this was the capital of the Selcuk Empire of Rum and we will see many examples of early Turkish architecture in the city, including the Alaeddin Mosque and the Karatay Medrese. However, the city is best known for the founding of the order of Whirling Dervishes by Mevlani Rumi, one of the great poets and mystics of the Islamic world. We visit the 13th Century Mevlana Museum with its famous pointed green burial tower. Driving across the open plain we pass several caravanserais. This is a chain of fortified hotels built by the Selcuk state in the 12th Century to encourage caravans of traders on the Silk Road to pass through their lands. First of 2 nights in Cappadocia. 4-Star Peri Tower Hotel or similar. Breakfast & Dinner. Today we enjoy guided sightseeing in the unique ‘moonscape’ Cappadocia region. Here the soft tufa rock has allowed various peoples over many centuries to carve underground cities, churches, and homes into the hillsides. We visit the Ozkonak underground city, carved into extensive passages and hidden rooms by 7th Century Christians fleeing from persecution. As we travel around the Cappadocia region we see dozens of areas where the weather over centuries has worn away the landscape to produce hundreds of fantastic 'fairy chimneys' and other hoodoos. We also visit the Goreme Valley, designated by the United Nations as a World Heritage site. Here, many brightly painted churches have been carved into t.he rocks. Second of 2 nights in Cappadocia. 4-Star Peri Tower Hotel or similar. Breakfast & Dinner. This morning we drive from Cappadocia to Turkey’s capital, Ankara. This afternoon we visit the Museum of Anatolian Civilizations. The wonderful collections here mainly focus on the ancient civilizations of central and eastern Turkey, including the powerful Hittite Empire. Our next stop is Anitkabir, the gigantic mausoleum of Ataturk - founder of the Turkish Republic.Overnight in Ankara. 4-Star Dedeman Hotel or similar. Breakfast & Dinner. This morning we drive from Ankara to Istanbul and cross the Bosphorus waterway back from Asia into Europe. The later part of this afternoon is free for you to explore some of Istanbul's many delights. 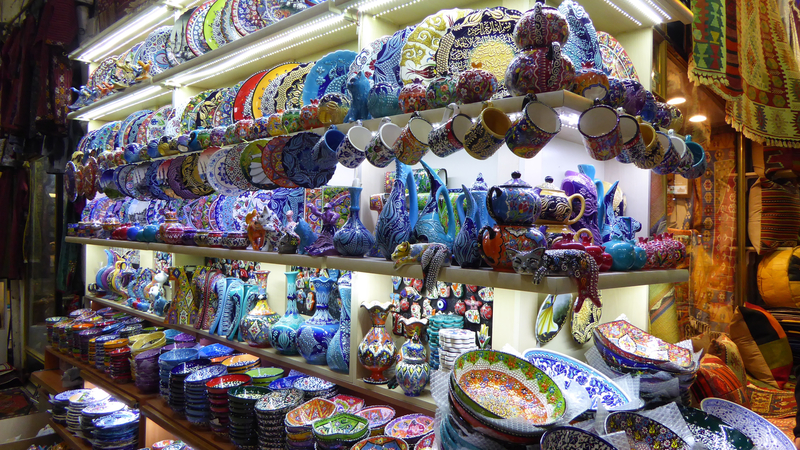 You might like to take a cruise on the Bosphorus or visit the famous Covered Grand Bazaar. Overnight in Istanbul. 4-Star Best Western Eresin Taxim Hotel or similar. Breakfast & Dinner. This morning we fly home via Europe to North America, arriving the same afternoon. - Accommodation mainly in good 4-Star hotels. All our hotels have en-suite bathrooms and air-conditioning. - Breakfast and dinner except( Lunch on Tuesday May 21 & Saturday May 25). Often we take dinner in the hotel (especially if we have had a long day of sightseeing). However, restaurants in many parts of Turkey are very good and so we try to include dinner out at a local restaurant. - Arrival & departure transfers. We can arrange individual or group transfers when you have confirmed the arrival & departure times of your flights. Please contact us for a quote. Our flight specialist suggests flights from Vancouver with Air Canada and Lufthansa via Frankfurt. You do NOT have to come to Vancouver to join this tour. We can put you in touch with our flights specialist or you are welcome to book your own flights from your home city. Please let us know. Our published price is based on 2 people sharing a room. If you wish to be guaranteed a single room, there is a Single Supplement charge of $695 Canadian. Those people traveling alone but wishing to share will be informed 3 months prior to departure if a roommate is not currently available. At that point, you will be invoiced for the Single Supplement. If a roommate subsequently joins the tour, your single supplement will be refunded with the final documentation. The land portion of the tour must be booked directly with Royal Heights Tours. You can secure your place on the tour with a $400 per person non-refundable deposit. We take payment by cheque, Visa or Mastercard for the $400 /person deposit. Your invoice for your Land tour will be e-mailed to you in mid-February 2019. Payment will be due by March 16th 2019. Price quoted is for FINAL PAYMENT by cheque. Should you wish to pay the outstanding amount for the LAND tour by credit card there will be an administration fee of 3% on the outstanding amount. -This tour is not suitable if you need walking assistance in the form of walking sticks or canes. You must be in reasonably good shape to enjoy this tour – there is a lot of walking and exploring through the back streets of old historic towns where our bus cannot travel. We will spend a lot of our time exploring by walking over cobbled streets and uneven surfaces around archaeological sites.